Thanks for this! Unearthly and swinging, which is a fine combination. Thanks flatint for the share, and thanks for the pennywhistle music from your collection shared earlier on this blog. O please where can I download this!! i would also love to listen to this album. Good afternoon ElectricJive team! David from Madrid. I have translated, as far as I could, those liner notes from spanish to english. It's not the best translation i guess but i think it can help others to understand it. Between parenthesis and / characters i used my own words to explain some details. Check and fix all text if you want to clear it finally to post it. Says ('reza' is a word from 'rezar' verb, means to pray, but it is used in many colloquial expressions and in literature, best translation is 'says' or 'reads' here) an old Greek proverb that "from Africa always arises/comes something new". We could expand it and say that from old (ways/things) always comes/arises something (other) new. The quena (a type of flute called quina in quechua languaje of the central Andes) is one of the first wind instruments used by man to give voice to the music sprouting from his being, when he tried to shape the sounds of nature heared around, to the concerns/restlessness of his indigenous soul , to the feelings of his heart. Today kwela arises/emerges from Africa with a new sound in the modern world . This quenita (little quena, -ita, -ito is used to mean 'little' same as 'chico turns into chiquito', boy turns into little boy) has been associated with a rhythmic accompaniment to produce a dance beat that is truly sensational and that is doing expectation/raging (attracting attention) all around the world/worldwide. 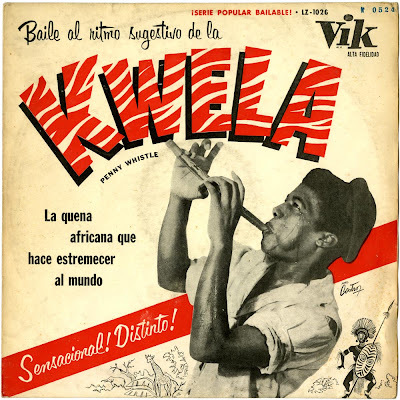 Its fundamental simplicity and repetition of melody and rhythm, perfectly adapted to modern jazz, are major/preponderant factors in the attraction that kwela exert on all (people). Indeed/for real, something new, something different, something sensational, has emerged from Africa! jejej i'm so rusty with english today!! Sure Siemon. Any help I can do it, with pleasure i will. Fix the text on the right way to do more comprehensive an easy to your readers (here one of those). 'Usted' is a way of treatment between people in those countries, and in Spain is used but only when we refer to old people or people who we must a high respect to. Usually we use 'tú' (you) to refer with others, but some people here use 'usted' (in english 'you' too) in some cases. So context here is in the air, a reader can understand one or other meaning.